Northern Ireland's Rory McIlroy and England's Tyrrell Hatton finished in a tie for fourth at the Arnold Palmer Invitational. 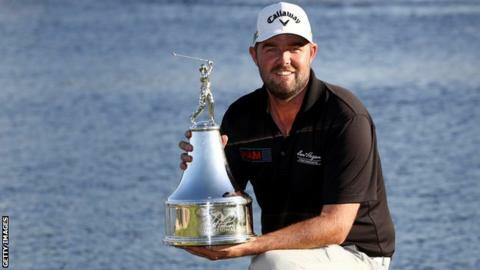 McIlroy (69) and Hatton (71) were two shots back of Australian winner Marc Leishman, who finished on 11 under par. Leishman's closing five-under-par 67, which included an eagle to take the lead on the 16th hole, was enough to earn him his second PGA Tour title. Americans Kevin Kisner and Charlie Hoffman were tied second on 10 under. "I thought going out today if I could shoot anything in the 60s it would be a good score," McIlroy told Sky Sports. "Obviously I was trying to shoot a couple lower than that, but overall played well. I'm really pleased with how I went this weekend and can take a lot of positives from it." England's Tommy Fleetwood shot a four-under-par 68 on the final day to finish tied for 10th at six under, with countrymen Justin Rose and Matthew Fitzpatrick two shots further back in a tie for 13th. McIlroy and Hatton will be back in action next week at the World Golf Championship Match Play event in Texas. What's spooking the golfers in Orlando? Read more on What's spooking the golfers in Orlando?